Georg Fischer (GF) Wavin is backing "Swiss Made"
Creation of electrical fittings for gas- and water supply systems around the world. Required technology that could provide fast, efficient and easy construction to achieve improved cycle times and satisfy the increase in demand. Automation of repetitive tasks and processes to guarantee better performances by using high-quality products including two large FANUC R-2000 robots and a small M-20iA handling robot. Due to this high level of automation, the site in Switzerland has been secured for the future. If three robots were enough, the issue of "site security" would be quickly sorted. At GF Wavin’s new facility for the injection moulding of electrical fittings in Subingen, they are quickly realising that as well as yellow robots, a great deal of systematic automation is needed. It is not just electrical fittings that GF Wavin’s Subingen plant produces. Working side-by-side with robots and a great deal of automation, some 100 employees pull out all the stops to produce the best possible plastic connections and fittings. In Subingen, teams work in four shifts 360 days a year. Apart from a few custom-built parts, pipe components and connecting elements are primarily made from polyethylene, to a standard for which the company is known. GF Wavin is part of the business unit Piping Systems, which with a turnover share of 39% (2015) is the largest sector in the GF group. To satisfy the increase in demand, its capacity has been expanded to include an additional automated injection moulding machine. The design of the robots themselves was easy since an existing system was duplicated, but this time using Fanuc robots. This made it clear what reach and payload were required. 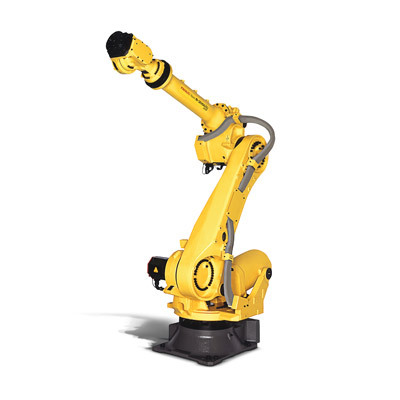 The general conversion to the yellow robots is, on the one hand, the result of a framework agreement between the GF group and Fanuc concerning the supply of robots, and on the other hand due to the package for this application, tailor-made to meet requirements in terms of cost and performance. "It was of strategic importance to have a second supplier". Performance and reliability are Fanuc’s trademark qualities. The existing cell has not been in use for very long. But there is a large demand for angled, 90 mm and 110 mm-diameter electrical fittings. The word is that "they are the bestsellers". The cell as a whole consists primarily of two Engel injection moulding machines, the winding machine, two large R-2000i robots and a small M-20iA handling robot. One of the two large robots unloads the first injection moulding machine and deposits the blank in front of the winding machine. The M-20iA takes over the handling of the winding machine and after winding fits another connector. This connector directly provides the power for the subsequent welding of the components on the site. The second R-2000i is a long-arm version R-2000iB/185L, which unloads the second injection moulding machine. The coiled blanks are then injected by the machine. Reach is the key element of the robot that unloads the second injection moulding machine. Its two "colleagues" have to work in shorter cycles. But even the movement time of the robots is used for additional tasks during the work cycle. In this way, each part is deposited, completely ready for further processing. Only smaller quantities or complex packaging are still processed manually. In all other respects, the production process is fully automated. Only at the very end of the line does an employee handle the part, which has already been packed in a bag and labelled with a barcode. The bag should not simply then be dropped into a container, which is why the employee performs a final visual check and places the bag into a shipping carton. "Swiss Made" goes hand in hand with "Swiss Quality". The cell is controlled by a master PLC. A simple panel enables the operator to input important data, which is usually limited to switching on and off. However, the cell integrator Paro has updated this as well and has improved screen clarity and menu navigation. Even the operation of the old robot cell benefits from all the improvements at the new facility. Pauli says: "The fact that we have fewer problems overall is simply part of the ongoing improvement process. The KUKA robots should also benefit from this." Every movement, every stop has been analysed. "And the process never really stops." As far as the cycle times themselves are concerned, those at GF Wavin take a proactive stance, as Thomas Ettlin, Head of BMP, explains: "We prefer to work a bit more slowly and spend two seconds on a cycle, which doubles our MTBF." This is much more efficient. Today it is common practice: The tools are cleaned every day, even if they remain on the machine. The time spent is also part of the proactive production concept. Fred Biedermann explains further: "The earlier and more regularly we deal with issues like this, the easier things are overall". During each shift, a few parts are unloaded and subjected to a thorough internal quality control inspection. Randomly selected fittings are also subjected to a pressure test. As the cell was planned as a capacity expansion, certain benchmark data and design criteria were established from the outset. The intention was therefore to be able to use the same tools in cells 1 and 2, for example. As process reliability is now key in defining the efficiency of a cell or system at GF Wavin, the cell layout was maintained as far as possible. Although the layout was based on the existing cell, project leader Fred Biedermann and the operators scrutinised the process point by point: What works well? Where are the most frequent maintenance problems? Where do bottlenecks occur? "We specifically looked for criteria that increase process reliability and security for the staff", recalls the project leader. Based on this, important modules, such as the Engel injection moulding machine, were also included in the new facility, whilst other new ones were integrated and some stages improved. Conveniently, the cell was built by the systems integrator Paro in the vicinity of the Subingen site. The plant has yet to reach its peak performance but its considerable increase in output is already evident, as plant manager Pauli says: "The process simply specifies the cycle times." However, as far as the process as a whole is concerned, there is certainly still room for improvement going forward. In the ten years since the first robot facility for electrical fittings came on stream, performance has improved by 40 per cent. "The better your command of the process, the more ‘control possibilities’ you have and the better the results." But, as Pauli stresses, the bottom line is always process reliability. "The aim of automation is to guarantee much better performance using high-quality products. A positive side effect of this is that the site in Switzerland has been secured for the future", says the plant manager. "Without automation, the site would no longer exist." Clear words, backed up by deeds: "we have made massive strides with respect to repetitive tasks." In the group of GF sites, there are also no capacities whose sole aim is safeguarding. Each site has its own specialities and consequently its own strengths. Pauli says: "We have analysed every step and every movement of the new facility. However, the resulting improvement is a process that we are driving forward relentlessly; one that challenges us every day and helps us remain efficient and flexible".